FALSE FLAG ATF Lies! Guns Not Tracked To Get Big Fish, All Low Level Guys. Is report the ‘smoking gun’ in controversy over guns-to-Mexico? 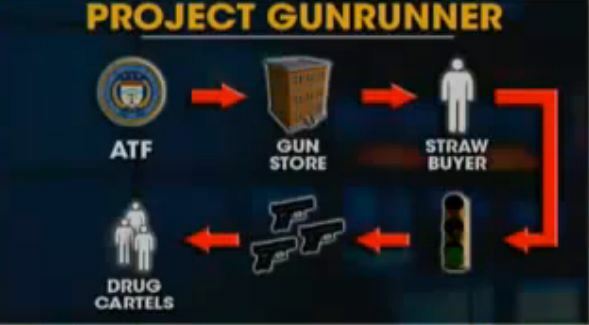 A document linked to a news story about the controversial Project Gunrunner may prove to be the “smoking gun” in the Obama administration’s attempt to distance itself from the operation, according to a team of Second Amendment advocates. “It seems to me that not only does this field manual describe what’s been going on in bureaucratic language, it’s pretty clear it’s pointing that the origin of this (operation), the request or the demand for this is right up to the White House,” he said. Pratt is referring to a two-sentence section on Page 2 that talks about the White House role in developing strategies to deal with the gun-smuggling issue. “Over the past few years the White House, the Departments of Justice and Homeland Security and even the U.S. Northern Command have developed various strategies and policies designed to leverage the full capabilities of the U.S. government in this effort,” the document stated. Then there’s the reference to the need to continue the cooperation in Project Gunrunner. “It is essential that our efforts support the strategies and policies of the president and the attorney general and where possible, complement the strategies of other agencies,” the document stated further. Pratt says he agrees with some of the ATF agents who have come forward to talk about the operational purpose of Operation Gunrunner. “This was an effort on the part of the administration to change the dialogue on the gun issue. Right now the Democrats don’t want to touch it; it’s like a third rail in American politics,” Pratt said. “But if you can blame all the dead bodies on bad gun stores, bad gun shows, then ATF would be able to step up and say, ‘We’ll fix that with more money, more agents and more gun control,'” he said. Pratt’s statement is based on a line from Page 5 that speaks about gun shops playing a role in the Mexican deaths. “While the United States is not the only source of firearms and munitions used by the cartels, it has been established that a significant percentage of their firearms originate from gun stores and other sources in the U.S.,” the document stated. Pratt believes that the administration had to know, from the beginning, that the operation would fail. “The official story is false on its face. There is no way they were going to be able to track guns once they went into Mexico and follow those guns up the food chain to the big boys that are running the cartels,” Pratt observed. Pratt said the operation was set up to fail because of Mexican law. “If you go in armed, much, much more time. The agent that was killed inside Mexico with one of the guns from Gunrunner or Fast and Furious as it was called at the point was there without a gun,” he lamented. “The idea that somehow we were monitoring those guns inside Mexico, that’s just not true,” he added. Alex Jones Webster Tarpley Wayne Madsen Ron Paul Craig Roberts Peter Schiff Max Keiser Gerald Celente John Pilger Stossel Judge Andrew Napolitano Freedom Watch Julian Assange WikiLeaks Michael Savage Rachael Maddow Chris Matthee Jeff Rense David Icke Mike Rivero Rush Limbaugh Jon Steward Stephen Colbert. ← With a global economic collapse now certian nations are returning to the ‘The Gold Standard’. Yep, policy comes from the elected officials. Implementing those policies is the work of appointees and agency heads. All needs to be approved. And the lie, that the guns were going to be traced to snare others, is obvious from its inception. U.S. law enforcement does not have operational authority to do anything in Mexico. Besides, we learned they did not tell the Mexican government. From what I’m learning, Rahm Emanuel may have initiated this conspiracy. If so, he should be extradited to Mexico to face charges. If he survives Mexican prison, he should be brought back to the U.S. to face charges here. So transparently obvious, this whole gun-runner thing is about Obama wanting to disarm America…..guess they are really afraid America may actually use their guns against a tyrannical government. One more term of this administration and you’ll see a recall on all hand guns in this country. The only way they can destroy the constitution is to take away our guns so we can not stop them from doing it. The constitution is what stands in there way to making this country become a Socialistic state. The obama care is part of this as well if it gets put in law then all those protesters out there will feel the teeth of the taxes that will come down on them and the middle class goes away in this country. ABSOLUTELY NOT! It is a tragedy of major proportions. Just as 9/11 was not a false flag operation as so many libs have claimed over the years since that horrific day.